Now you know why ABS-CBN's "Huwag Ka Lang Mawawala" is pitted against GMA-7's gay-themed teleserye "My Husband's Lover!" Yeah, it's because the main antagonist Romulus played by the veteran actor Tirso Cruz III is a gay! This is true and not anymore a rumor! Romulus' big secret is that he is a gay man! And his appearance as a gay cross-dressing into female was already shown in the teaser of the Wednesday, August 21 episode of the said teleserye! In the said teaser, the character of Gretchen Barretto caught in the act the cross-dressed Romulos. She took photo of the gay man which she will use as an evidence to her enemy! 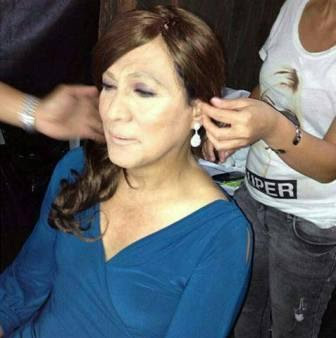 This is not actually the first time that Tirso played a gay character dressing like a woman in a TV series. We may recall in 2011, Tirso played a gay role in another GMA-7's gay-themed teleserye "I Heart You Pare" starring Dingdong Dantes, Regine Velasquez, and Iza Calzado.